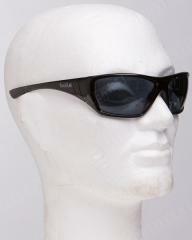 Protective sunglasses for cheap! These are really tough, as they have certified ballistic protection. We got an outlet batch for cheap, and once these are gone, there won't be anything as good for this price. Good fit with some extra grip on the nose area - these won't fall off! Fulfills CE EN 166, which means these go for certified protective eyewear. The EN166 standard means these will handle a 6 mm 0,86 g ball pellet coming at 45 m/s. In other words, 0,87 J. This is the highest rating Bollé gives for templed sunglasses, the "shotgun proof" stuff is for mask-like protective gear that have a strap instead of temples. As it is, altough home testing proves no airsoft gun penetrates these, they aren't certified for airsoft. Factory new, made by the French Bollé. Let us emphasize that these are proper quality glasses despite the price.